Ian Baird’s Spitfires will be in search for a third straight win in all competitions when they travel to Eastbourne Borough on Saturday at Priory Lane. However they face a difficult challenge as Eastbourne Borough is currently nine places above The Spitfires in the league and five points clear. The Spitfires won comfortably against Cinderford Town 3-1 (they are two leagues below Eastleigh) in the FA Cup second qualifying round. The Spitfires opened the scoring with Captain Tommy Jordan doing well to slot home his first goal of the season and Andy Forbes doubled the lead eight minutes later to also score his first as well. Andrew White came on in the second half – his cheeky lobbed effort on goal was saved only for the former Reading striker to pounce on the rebound. There was time for Cinderford Town to get Dale Evans, their Captain sent off and for The Forrester’s to score a well deserved goal from a set piece. Eastleigh now has a home tie to Oxford City next Saturday in FA Cup qualifying third round. The Sports (Eastbourne Borough FC) like Eastleigh, also faced a team two leagues below them,- Waltham Forest, however it took then seventy minutes to break the deadlock. Gary Elphick headed home the opening goal, with Ben Watson and Carl Rook securing a solid win for The Sports. The last time these two teams met was in a pre-season friendly at The Silverlake Stadium where Eastbourne Borough won 0-4. Eleven of the players that were involved in that match still play for Eastbourne Borough and only seven Spitfires from that match remain in the Eastleigh squad. 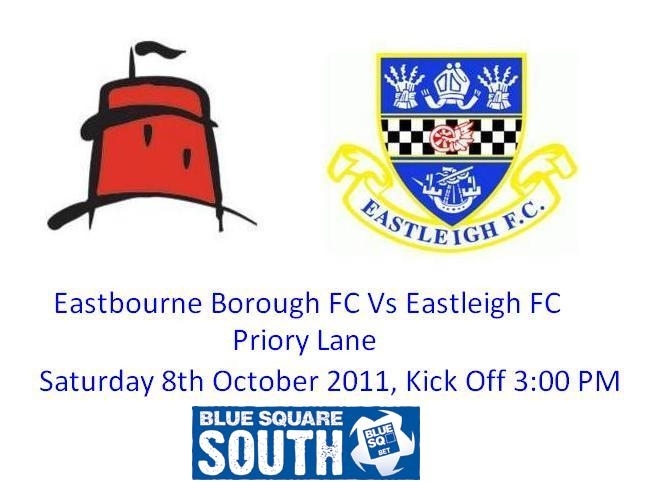 The last time meet at Priory Lane was in the 2007/2008 season and the result was 3-2 to Eastbourne Borough with Jamie Brown (Eastleigh), Darren Baker and Matt Crabb (both Eastbourne Borough) the only players stll in the squad for Saturday’s game. However previously at The Silverlake, Eastbourne Borough won 1-2 with only Andy Forbes (who will be in the squad for tomorrow’s game) scoring the once for Eastleigh. The Sports managed to get promoted that season after winning the play-off’s however their non league top flight lasted three after getting relegated in the 2010/2011 season to the Blue Square Bet South. The last time Eastleigh managed a point against The Sports was in the 2006/2007 season where it finished1-1 at The Silverlake Stadium. Sam Wilson will not be in the Eastleigh squad tomorrow after impressing Premiership outfit Fulham, the young striker has been asked to come back and do a trial game on Saturday after training again with the club Thursday and Friday. This is a big game for Eastleigh so roar on those Spitfires at Priory Lane tomorrow at 3:00 PM!